Happy Black Friday y’all! I hope you had a yummy Thanksgiving with your family and friends. Now that the turkey and pumpkin pie has been eaten, we can focus on Christmas shopping. Shopping for guys- whether it’s your hubby, boyfriend, dad, brother, best guy friend- can be hard. You want to get them something nice, but guys don’t get as gaga over clothes and shiny things as us girls do. 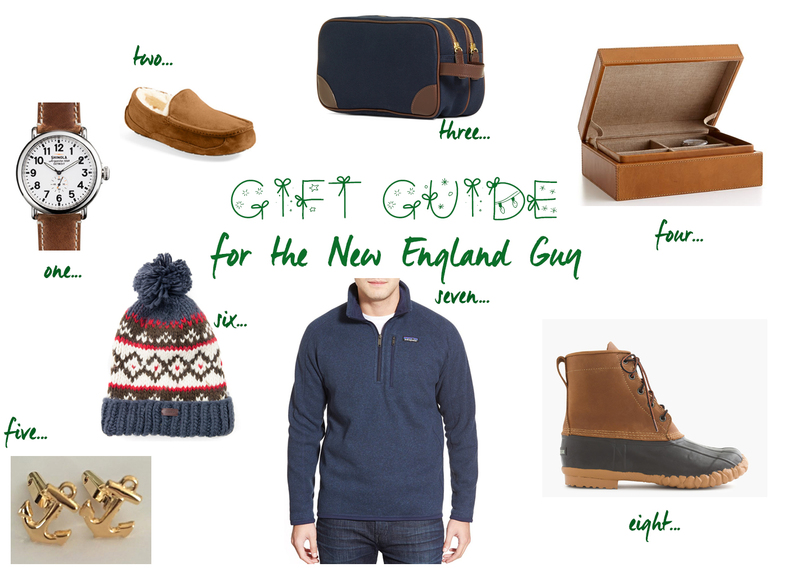 With the help of my hubby, MJD, who is about as New England as one could be, I’m sharing today’s gift guide for the New England guy. one. Shinola Runwell Watch: When I first asked MJD what I should put in this gift guide, his immediate answer was a Shinola watch. I wasn’t too familiar with them before he mentioned it, but I can totally see why his response was so enthusiastic. These watches are gorgeous… I mean, handsome and manly… and any guy would be happy to wear one! two. Ugg Ascot Slipper: I also put Ugg slippers on my gift guide for the New England girl and there’s a reason why- they are literally the best slippers around. MJD lives in these during the fall and winter and your guy will too. three. Brooks Brothers Canvas Dopp Kit: A dopp kit is something most guys wouldn’t buy for themselves, so I think it makes for a great gift, especially for the guy who likes to travel a lot. five.LK Meyer Gold Anchor Cuff Links: Give him something to fill up that valet! What New England guy wouldn’t love a pair of anchor cuff links? My friend, Lauren and her brother started this line recently and I think their cuff links will make amazing gifts this holiday season. Get 25% off your purchase with code HOLIDAY25. six. Barbour Easton Beanie via Tuckernuck : Chances are your guy may already have a Barbour jacket, but did you know they also make beanies ? I think this one would make a great stocking stuffer. Ps Use code CYBER-15 for 15% off! seven. Patagonia Better Sweater Quarter Zip: The quintessential Boston guy pullover- it is often seen at the bar during Patriots games or in the ski lodge after coming off the slopes. It’s versatile, it’s comfy and it’s warm- making it a Christmas gift that will get tons of wear! eight. LaCrosse for J.Crew Duck Boots : So maybe you wanted to get your guy a pair of duck boots for Christmas and forgot to order and now the ones you were thinking of are back ordered until like March? Oops. This pair is the classic duck boot style with the kind of quality you expect from J.Crew. Guys, reading this and need some ideas for your lady? Check out my gift guide for the New England girl.